Pedestrians walk by the Space p11 gallery on the Chicago Pedway on 55 E. Randolph Street on Tuesday, Dec. 11, 2018. 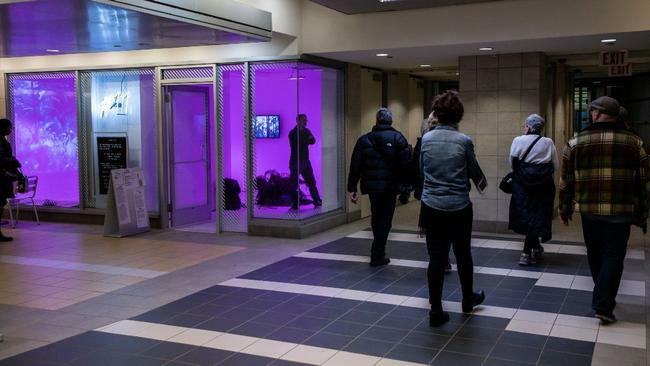 Courtesy of Zbigniew Bzdak / "Chicago Tribune"
Chicago’s Pedestrian Walkway System, commonly known as the Pedway, is getting a temporary new art gallery that will feature colorful video portraits of nature and pop-up performances according to Curbed Chicago. The new gallery, Space p11 is directed by SAIC's Director of Architecture, Interior Architecture, and Designed Objects (AIADO) Jonathan Solomon and David L. Hays, associate professor of Landscape Architecture at the University of Illinois at Urbana-Champaign. The gallery design by Future Firm, a Chicago-based architecture and design practice cofounded by AIADO Assistant Professor Ann Lui will incorporate window displays and neon signs in its design to attract the attention of commuters, students, and tourists. There are currently two temporary exhibitions scheduled for the space including a video series by Adjunct Assistant Professor of Contemporary Practices Lindsey French (MFA 2013). "It takes a space that people use as an escape or for a commute, and turns it into a place where reflection might happen," says Curbed Chicago of the gallery, which made it's list of "7 small projects that had a big impact in 2018."